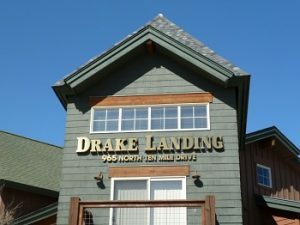 Drake Landing Condo in Frisco CO Real Estate is steps from Lake Dillon and the Summit County Bike Path. Built in 2000, there are 46 condos comprised of 9 – employee deed restricted units, 3 – one bedrooms, 9 – one bedroom plus loft, 3 – 2 bedrooms, 20 – 2 bedrooms plus loft and 2 – 3 bedroom plus loft residences. The condos range in size from 839 – 1634 square feet. Some of the units are sold with detached one car garages and/or separate storage units. All the properties come with decks with views of either Lake Dillon or the surrounding Rocky Mountains. After a fun day biking, hiking, skiing and enjoying all the activities Summit County has to offer you can relax in one of the two outdoor hot tubs or grill a nice meal in the common grill area at Drake Landing Condo in Frisco Colorado Real Estate. Drake Landing Condo is nicely situated within a few minute walk to Main Street Frisco and the Frisco Bay Marina. If you love coming to Summit County and want a property that is centrally located, Drake Landing Condo is the place to look. For additional information about condos for sale in Frisco CO and Drake Landing Condo, contact Justin and Krystal Knott with LIV Sotheby’s International Realty.